This post about the LOFT April 2018 Friends and Family Offer contains affiliate links. Please read this blog’s disclosure post for more info. Before we begin, just a quick administrative note. My Mom is getting very close to making a move into her new condo. As the daughter living closest to her (my Sis is out in Colorado) I’m helping Mom out as much as I can, which means posting over the next three weeks may be less frequent than my ideal at times. I appreciate your continued support as I help Mom through this major life change! At any time, if there is something you wish to discuss and there is not a post up for it yet, please feel free to use the comments of the most recent post to start a conversation! I’ll have a post for Anthropologie’s latest survey for example tomorrow. Thank you!! This post could easily be called color, color everywhere (and I love it!). Colors are brighter and more vivid than usual this season! When done wrong things can really go off the rails. When done right? It’s a beautiful thing to behold — and to wear! LOFT is truly embracing this trend with colorful dresses, pastel perfection and explosions of florals. Of all the retailers I love LOFT is winning the joie de vivre race. Their new model angles and poses are beautiful, although I am frustrated by all brands that don’t have a simple, straight-on shot of their products! Right now you can take 40% off your purchase during the LOFT April 2018 Friends and Family Offer with the code Friends. It’s been awhile since we last checked in with LOFT. Meanwhile, they’ve been churning out ever more delights. Let’s begin with dresses, where soft designs like the Mixed Stripe Flippy Dress (now $56) is something I can wear both to work and afterwards too. 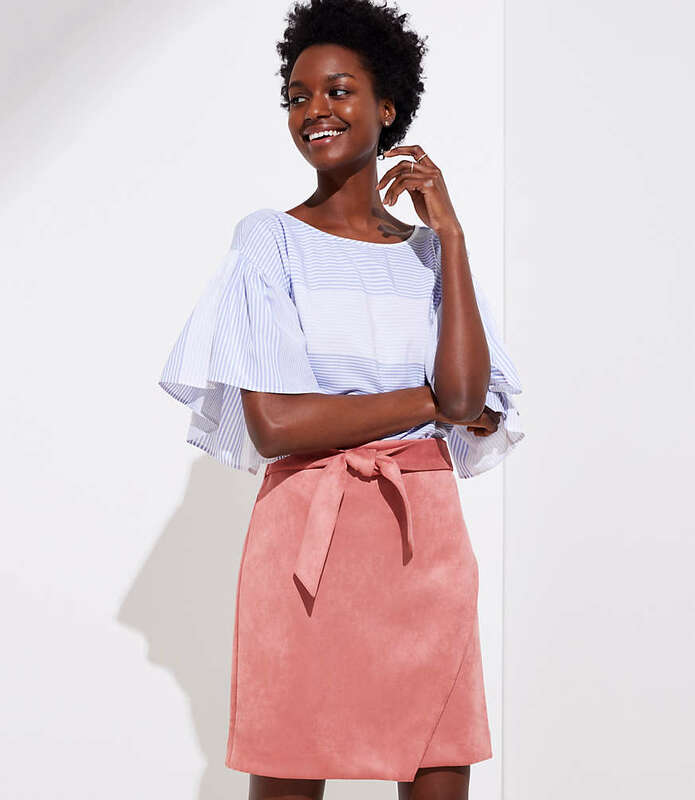 I’ve found soft designs like the Ruffle Waist Tie Dress (now $56, lovely in lilac) and more bold takes including the Abstract Floral Flounce Dress (now $56). It makes so excited for this LOFT April 2018 Friends and Family Offer! The timing really couldn’t be better. Also, you’ll find further cute frocks in LOFT’s Beach collection. You’ll find adorable cover-ups like the LOFT Beach Tasseled Caftan (now $42) and the Lacy Drawstring Dress (now $42). Further, there are really wonderful ship to shore options like the Beach Striped Wrap Dress (now $48) which has poor reviews in part because I don’t think people realize it’s a beach piece. I found it quite lovely on! I even really like the Striped Jumpsuit (now $56) which again I think is poorly reviewed because it’s unclear that this is a beach piece. And although LOFT doesn’t have them in the Beach section, they’ve got several cute beach sweaters too! I’m partial to the Stitchy Boatneck Sweater (now $36) that you’ll see a little further down in this post and its striped cousin. LOFT has a fantastic way of interpreting trends in a highly wearable way. During this LOFT April 2018 Friends and Family Offer, I’m in love with the Tiered Shift Fringe Skirt (now $42) seen above. It’s a great color, and has trendy accents but not in a ridiculous way! Likewise, the lovely Scalloped Trim Shift Skirt (now $42) comes in a new color after the first one quickly sold out. Each year LOFT comes out with a great textured skirt. This year’s version is the Striped Texture Pocket Skirt (now $36) and it might be the third skirt of its kind in my collection soon. I’ve got another cute skirt pictured further down in this post and plenty in the shoppable boutique at the end. Another area LOFT has conquered with color is pants. So many beautifully colorful pants!! (And some jeans too.) It’s hard not to love pants like the Girlfriend Chinos (now $36, above) which come in a plethora of delightful colors, or the modern Frayed Girlfriend Chinos (now $36). LOFT is pretty good about making sure all cuts are covered. For example, the seriously tempting Skinny Zip Pocket pants come in modern, Julie (curvy) and plus sizes. In the event that like mine, your closet is already pretty full of colorful denim I invite you to peruse the embroidery LOFT is adding to its jeans in pants like the Embroidered Skinny Crop Jeans (now $48). LOFT also has amazing white jeans — no see-through issues! I own and marvel at the Curvy Skinny Jeans in white (now $42). With your perfect look assembled — I love the outfit above! — the only thing left to do is accessorize it equally perfectly. With this in mind, I’ve long been a fan of LOFT’s jewelry which runs the gamut from dainty to daring. My Crystal Stone Necklace Set (now $24, on me here) is an absolute compliment magnet for example. There are coordinating earrings available too. Most of all, LOFT has some surprisingly cute shoe options too! I’m still rocking a pair of heeled sandals I got there two years ago. In this year’s selection I’m loving shoes like the Lace-Up Espadrille Wedges (now $54), the Satin Knot Slide Sandals (now $42) and the Metallic Cap Toe Espadrille Flats (now $42) to name a few. More great shoe and accessory options below as well as colorful clothing galore! What might you buy in the LOFT April 2018 Friends and Family Offer today? Next Post Contest time! Win a 5 Triangle Necklace from Peggy Li! Loft really does have cute things and thankfully has petite options in the store. (Hate that Anthro has them only online in my area.) I recently got a couple different colors of the girlfriend chinos. I haven't tried their jewelry. I'm a minimal accessorizer. Right? I am not petite but it seems so simple to have petites in every store. I wish they carried talls in store too! Loft has some good things right now – lots of cotton. And now I just read the top of your post.Wishing your mom all the best in her new place, and good luck with the move!!! Oooooh I love that floral embroidered bell sleeve top! The swiss dots are a nice touch. That ruffle skirt is also gorgeous. A nice midi option. And thank you for the well wishes! It's pretty stressful right now but I'm sure we'll get there.